Candy Crush addicts, and you know who you are, put down your mobile device immediately. Then you can watch "Candy Crush," the TV game show. LOS ANGELES (AP) — Candy Crush addicts, and you know who you are, put down your mobile device immediately. Then you can watch "Candy Crush," the TV game show. Expect breezy, energetic fun from the CBS series debuting 9 p.m. EDT Sunday with host Mario Lopez, said executive producer Matt Kunitz, whose credits include "Wipeout" and "Fear Factor." Nearly 200 billion game rounds were played in the Candy Crush Saga last year, according to its maker, King. 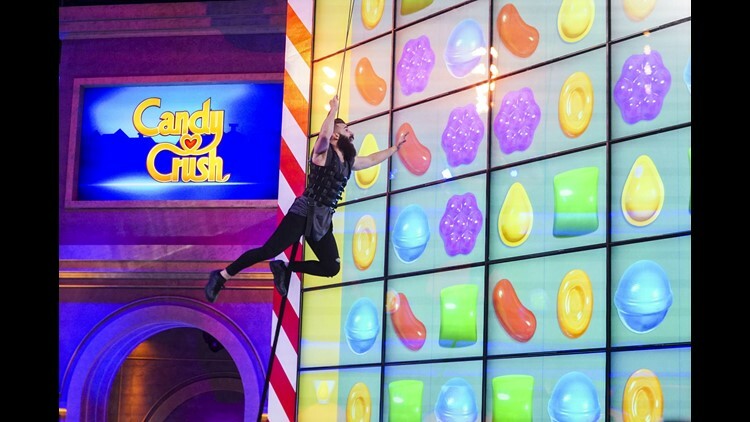 To entice people to watch it on TV, "Candy Crush" supersizes the visuals and the action. Two specially designed video walls, each made up of 55 monitors and measuring more than 20-by-25 feet, require contestants to physically scramble as they compete for the weekly $100,000 prize. One wall is placed horizontally on the stage floor, the other is perpendicular to it, and players in safety harnesses scoot across and up and down the screens. They make candy matches by, natch, swiping squares a la the mobile game. The stunt team that handled Lady Gaga's rig during her airborne entrance to this year's Super Bowl halftime show did the same for "Candy Crush," with the same injury-free success, Kunitz and CBS said. Taping is completed. When the show was pitched to the network, Kunitz said, they asked CBS executives to imagine "if you were playing on your phone and got sucked through and were in a Candy Crush arena." The video walls were key, he said. Their surfaces needed to withstand running, jumping and sliding and respond only to the swipe of contestants' hands. Producers ended up going with a company, MultiTaction, that had created a 44-monitor wall for the Australia's Queensland University of Technology. That was the world's biggest, Kunitz said, until "Candy Crush" came along — and he points to a Guinness World Records citation attesting to that. Each monitor has 32 cameras to record the flurry of hand swipes. Many video games have been translated to the movie screen, from "Super Mario Brothers" to "Tomb Raider" to "The Angry Birds Movie," but it's rare, if not unprecedented, for a game to come to television, said Sebastian Knutsson, a King executive who helped develop Candy Crush. The game's simplicity "actually translates very well" to TV, he said, and the audience's perspective allows them to see opportunities more readily than the contestants who are so close to the oversized boards. How protective did he feel of his baby during its TV adaptation? "It's been very important to us that this stay true to the core of how you play the game, and that it wouldn't break what we think of as the core rules of Candy Crush," Knutsson said from Stockholm. That doesn't mean the TV show had carte blanche. King shared a Candy Crush style guide with details on the color and size of each candy character, Kunitz said. It was so precise that it dictated the dimension of the line around each character and their size in relation to each other. It was understood that some things might change slightly on TV, Kunitz said, and, in turn, he appreciated what was at stake. "There's a huge expectation from the audience of what this show should be, because hundreds of millions of people play the game," he said. "I wanted to make it bigger and more spectacular and prime-time. That's a fine balance. You don't want to mess up the brand. And it is a brand, a massive brand." Nearly two-dozen different challenges for players help make each episode feel unique, he said. While great effort went into the production, Kunitz said he hopes that viewers will be unaware of all the work and simply enjoy the show. "It's just fun. That's all it is," he said. "We're not grossing anyone out, no one's wiping out, no one's 300 feet in the air hanging from a helicopter. It's just pure summer fun."